When I was a kid, I was OBSESSED with convenience store mystery bags. If you grew up in the 80s and 90s you probably know what I'm talking about. They were around $2 and had candy, a plastic toy and trading cards in it. I loved the idea of being surprised and taking a risk with my hard earned allowance even if it wasn't always what I directly wanted. Needless to say, this generalized excitement about surprises has not gone away, and this leads us directly to the FabFitFun Subscription box! Long-time readers may remember I used to review quite a few subscription boxes back in the day. I would rotate though Julep, BeautyBox5, TopBox, Ipsy and Birchbox in particular, but I found myself tiring of having a giant pile of "deluxe samples" and from the constant repetition in the offerings. And as many of these boxes don't exist anymore, I think other customers probably agreed with me. But while these monthly boxes have seen a decline, the quarterly GENIUS of FabFitFun emerged! 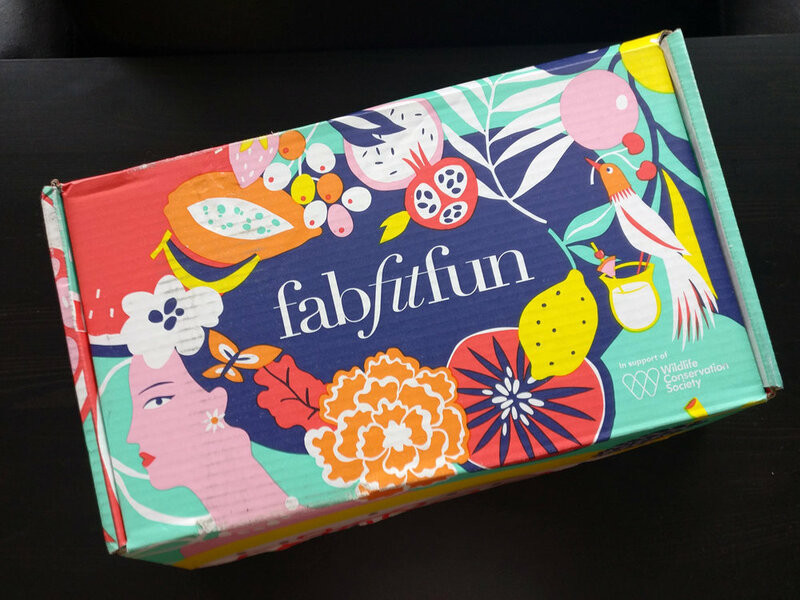 FabFitFun offers quarterly semi-customizable subscription boxes that don't just focus on makeup, but also lifestyle items like jewelery, fitness accessories, bags, skincare and more. I've seen ads, reviews and promotions for FabFitFun EVERYWHERE over the last few years and decided it was finally time to dip my toes into it. My one concern though as a Canadian, is an age-old question. Is it worth the extra tax, duty and shipping to get this subscription box? I thought I'd wait until I had TWO boxes of FabFitFun before I wrote my conclusions, so read on for my findings! The KEY selling point for me this month was the Foreo LUNA Fofo, a portable facial scrubber which is something I've wanted for awhile but just couldn't justify buying. 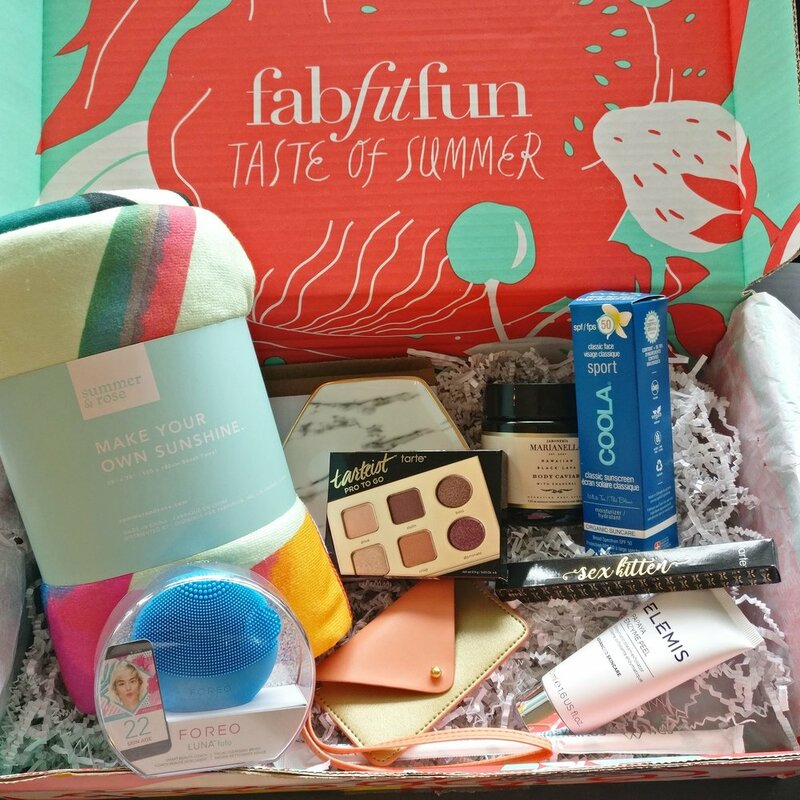 So when I saw that the FabFitFun Summer 2018 box included one in every box? I knew I had to try it. Summer & Rose Beach Towel - ? For some reason the beach towel was not included in my subscription pricing estimate, but I most definitely received it! As mentioned above, I subscribed almost entirely to get the Foreo Luna FOFO with this box, so I absolutely got a deal with this box! While I wasn't really a fan of the Minor History Wallet or the Coola sunscreen, I loved the ring dish, both the Tarte cosmetics and the towel A LOT. The question is whether I would ever SPEND the amount of money that these items cost, but that's something I can deal with another day. For this month, I was immediately drawn to the Vince Camuto tote bag. I have a variety of bags snd purses but nothing quite like this one. I ended up choosing the dark brown "rum" colour instead of the black. Some products have specific CAD prices, others I based off of the USD prices. The Vince Camuto tote was an exclusive but I found it for sale on Spring, the Alfred French Press was also exclusive, so I estimated. I think this month was a win! I've used the tote a few times, and though I don't usually like bags without zippers, I really like how sleek it is. I was excited to see Beautyblender, Farmacy and Glamglow because I've purchased things from all three of these brands before, and while some other other things weren't as exciting (tea towels, french press) they are definitely things I can use. I had one initial issue with this box though, my Cylo headphones came with one of the earbuds sounding significantly weaker than the other. I contacted FabFitFun customer support and they provided me an email to reach out to Cylo directly and I had a replacement within a week! Am I continuing with FabFitFun? I think the last two months are a great example of the quality and usefulness of the FabFitFun subscription box. I've been more than impressed with the product selection and every month it's been absolutely worth the price I've paid for the box. I'm actually considering upgrading to the FabFitFun select box to get a bigger discount on every box and priority shipping too! If you're interested in trying out FabFitFun, please feel free to use my referral code for $10 off your first box. I hear the Winter boxes are some of the best and those start selection on Friday November 3 for seasonal subscribers. Join in the fun!